HISTORY OF ESPRESSO: Espresso is a specialty coffee brewed by forcing small amounts of nearly boiling water under pressure through finely ground coffee beans. Espresso is generally thicker and more highly concentrated than coffee brewed by other methods, often featuring a creamy foam on top. SUBSEQUENT USES AND CLEANING: To use, fill the base with fresh water up to the level of the safety valve and insert the filter funnel. Fill the filter funnel with finely ground coffee (do not press down), and screw the assembled top firmly to the base. 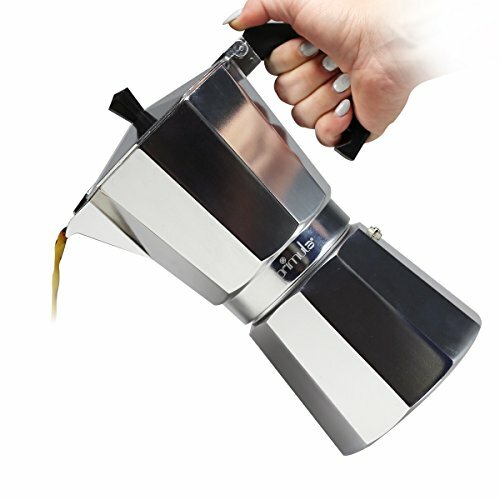 Place the espresso maker on low to medium heat, and within 3-5 minutes, delicious espresso will fill the serving chamber. Serve immediately. To clean, hand wash only. Do not use a dishwasher.